Research - Laura C. Bucci, PH.D. Recent demonstrations of growing economic inequality in the United States raise normative concerns about the political representation of all but the very wealthiest citizens. Building on existing cross-national work on the roles of unions in welfare states, I provide evidence that organized labor, as a political institution, limits unequal income distributions in the U.S. states. The states are useful to our understanding of labor's influence on inequality as states differ in their acceptance of labor unions, base levels of inequality, political preferences, industries, and levels of development, but are all nested within a single overarching national framework. Over the 39 year period examined, states where unions maintain more members remain more equal within the labor market and after redistribution via government transfer. These effects persist after accounting for state level policy, demography, and economic conditions. However, states where union membership has the largest influence on inequality have also seen growing attempts to reduce unionization rates. Overall, I find that unions are still able to limit the growth of economic inequality in spite of declining levels of union membership. Union membership in the U.S. has declined over the last fifty years shifting the occupational composition of labor. Today, a member is more likely to be nonwhite, female, and in the public sector than previously. Do stereotypes about labor reflect changes in the occupation of a typical member? How are evaluations colored by partisan affinity towards an occupation? 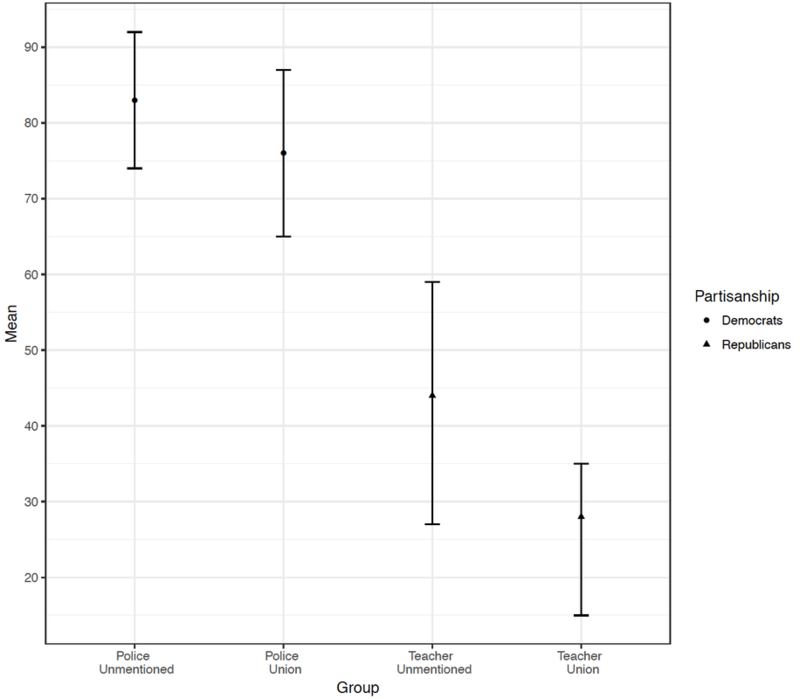 This research suggests that when union members are associated with the alternate party, opinions toward organized labor grow more negative. Using an original survey experiment on the Cooperative Congressional Election Study, I find that while Republicans may be more likely to disagree with the existence of unions than Democrats, they are more supportive when a typical union member works for the police. Democrats, on the other hand, are very supportive of organized labor when its most typical member is a teacher, but less so when that person is in the police. It is not unionization, per se, but the types of people unionized that influence support. This work expands our understanding of how occupational stereotypes influence preferences. What leads states to adopt more restrictive labor policies? We argue that lawmakers seek cues from organized labor and the opinions of the wealthiest citizens of their state when shaping labor policy. While states with higher levels of union membership are likely to have less restrictive labor policies, this relationship is attenuated by signals from the wealthy to limit the power of workers. We test this theory by measuring restrictions in five different areas of labor policy --- minimum wage, worker’s compensation, prevailing wage, right to work, and collective bargaining---in each state from 1992-2014. We measure changes in public opinion of unions in each state over this time period and examine the effect of this variable on changes in labor policy. This study extends the literature on the power of elite opinion to shape policy, and act as a force to counter the organizational power of workers at the state-level. Organized labor has been a major mobilizer for the Democratic Party, increasing turnout for low-income union members as well as other potential voters. As unions decrease in membership, are low-income people less likely to vote than they were previously? I argue that the decline of organized labor impacts demographic groups differently. Using a large-scale collection of individual level data from the Current Population Survey (CPS) on voter participation, I find that low-income whites drop out of the electorate when they were left without alternate mobilizing forces. In contrast, for low-income African Americans, consistent messaging from churches, race-based groups, and communities all point potential voters to the Democratic Party. The difference in propensity to vote takes place primarily among low-income people. The overarching consequence of changing political participation is to shift the racial composition of the low-income segment of the Democratic electorate, impacting how the party sees and relates to low-income people. The 2010s marked a wave of labor legislation that limited collective bargaining in states that were once heavily unionized. Michigan, a state that unionized over 40\% of its workers in the 1970s, passed a Right to Work law in 2015. 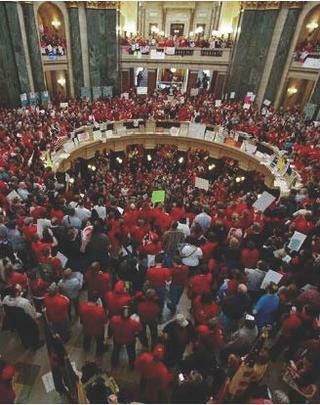 Does public opinion toward organized labor support the adoption of labor curbing legislation in a state? By using nationally representative opinion polls and multilevel regression and post-stratification (MrP), I create new state specific estimates of union support. Overall, I find that opinion toward organized labor has declined slightly over time, but this trend is driven by polarization among partisans. States that adopt limitations to collective bargaining, Right to Work, or additional labor legislation do not show more extreme opinions, or a more negative shift in opinions, toward organized labor. These results add a new policy arena into the study of state public opinion, and call into question whether labor policy diffusion in the states is in any way congruent with the wants of citizens.